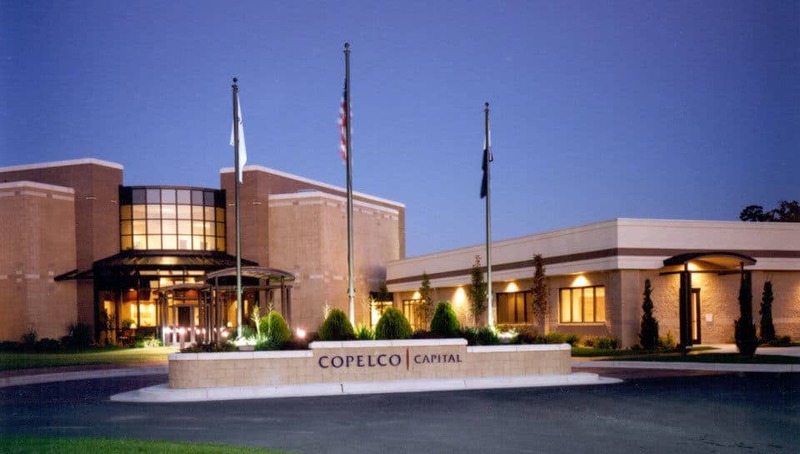 COPELCO Capital Building - PWArchitects, Inc.
COPELCO Capital, a business financing and telecommunications company headquartered in New Jersey, wished to add on to their existing 6,500 square foot building. With the growing business world, COPELCO saw a need to expand the facility to accommodate approximately 200 employees. PWA was brought on board to meet these needs. Two separate buildings were built in adjacent to the existing building. The final result was three buildings each connecting to the other with a courtyard in front. To cater to the expected expansion of this company, the center building was designed so that an additional floor could be added. In this instance, the flat roof would be used as the floor for a future third-level addition. The new south building was also designed for expansion. The focus of the building is on the center structure. The courtyard with the steel and glass entrance to the building is inviting to clients. PWA also specified all furnishings, while collaborating with COPELCO, due to their own company standards. In addition to size, this building had several other demands that had to be met. Relying mainly on modern technology, such as computers and other items that use and expel a tremendous amount of energy, this building needed a more efficient way to heat and cool, as well as the appropriate backup systems to protect these items. In answer to the first demand, ground source heat pumps were installed. This efficient form of heating and cooling incorporated wells in the ground where the earth’s natural thermal heat could be harnessed. For the second demand, battery and generator back-up systems were installed to protect the machines and information that this international company relied upon.